Verdi doesn’t want to grow up; can he stop? 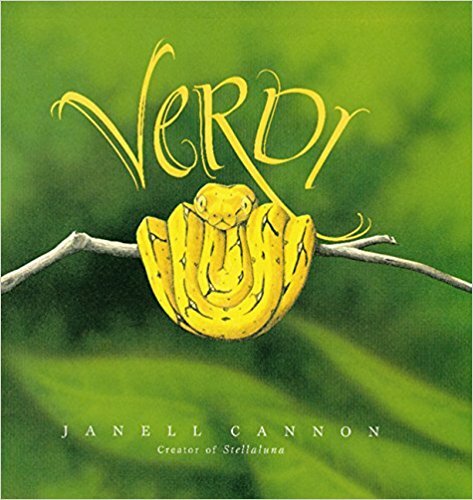 Verdi came out when my daughter was four and already in love with Janell Cannon’s Stellaluna. Add in that her favorite color is green and it was adoration at first sight. Verdi became one of our all-time favorite books to read together. (Stellaluna was a tie, along with a few others.) When I got a shower invitation from my niece lately asking people to bring a book instead of a card along with their gift, I grabbed three of our old childhood standbys: Stellaluna, Verdi, and The Runaway Bunny. It’s so hard to choose so few out of so many of our favorite books, so she may be inundated with more books as her son gets older. 😉 I also ordered a new favorite, A Boy and a House, but I’m not sure it will get here in time for her shower. Verdi starts the story as a baby green tree python. He is enamored with his bright yellow skin, jaunty stripes, and speed. He does crazy stunts such as catapulting himself into the wide open sky without a thought for anything but the exhilaration of flying. (The expressions on his face are priceless.) As Verdi wanders through the jungle, he spies some old green tree pythons. They’re slow, spend more time thinking about food than actually doing anything, and well, as far as Verdi is concerned, the old greens are slow, dreadfully boring, and he never wants to be one. In their defense, the old greens wish Verdi would be more careful; he could get hurt or put an eye out. These young snakes are awfully reckless. Just as the old greens thought and worried about, there comes a day when Verdi’s antics result is some serious injuries and those old greens that he thought were boring are the very ones who come to his rescue. They patiently nurse him back to health. As he recovers, Verdi learns to slow down and savor life. But does that mean he’s turning into a boring old green? Not if he can help it. The vibrant pictures by Janell Cannon are whimsical, beautifully colored, and absolutely hilarious at times. Verdi is a story of what it means to grow up, staying young at heart, and realizing that getting old isn’t as bad as it might seem. Lots of good conversations will start with reading this book, not to mention initiate countless hours poring over the intricate and delicately colored illustrations. Cannon includes two pages about snakes at the back of the book, for inquiring minds to learn more about snakes and green tree pythons. Highly recommended for anyone who loves to share beautiful picture books, heartwarming stories, and inspiration to understand that growing old isn’t the end and being young isn’t that bad either. Simply one of the sweetest picture books for children out there. Young Verdi doesn’t want to grow up big and green. He likes his bright yellow skin and sporty stripes. Besides, all the green snakes he meets are lazy, boring, and rude. When Verdi finds a pale green stripe stretching along his whole body, he tries every trick he can think of to get rid of it–and ends up in a heap of trouble. Despite his efforts, Verdi turns green, but to his delight, he discovers that being green doesn’t mean he has to stop being himself.